South Africans do love the outdoors, it's what we do. Beer, braaivleis and bundu-bashing to be more specific (hopefully not in that order I might add) should be added to the dictionary definition of "a South African", of course with a "fanatical about Rugby" side note. However, whilst beer consumption and the fine art of braaing we have easily mastered, bundu-bashing or off-road driving, although we think we've totally mastered, is a skill that very few are truly proficient at. Most of us (men) when it comes to off-road driving, like asking for directions or reading a manual, believe that it is something that we are inherently born with and are in no need of training whatsoever. Of course this is a load of bulls...well, you know what I mean. The truth is that most of us actually know diddly squat when it comes to off-road driving and whilst your brother-in-law might assume he is a Camel Trophy protege and might have some excellent advice, when buying your new 4x4, would you not want additional knowledge from an expert hand? Someone with three decades of off-road experience, someone who has been around the block a few times and indeed someone who is keen to impart with that wealth of knowledge? Someone like Alan Pepper at Bass Lake Adventures perhaps? I know I would, and whilst I haven't recently purchased a new Suzuki 4x4 (the underpaid hack that I am ;), I had the Suzuki Jimny on test for the week and with that mind Suzuki SA invited me to attend the 4x4 driver day hosted by themselves and the folks at Bramley Suzuki in Johannesburg. I would be leading the pack, driving the plucky Jimny. Bramley Suzuki have realised that in order for their customers to truly appreciate and utilise their new purchases, an introductory 4x4 course is essential, and as such they provide this training at Bass Lake as a free add-on, on all new 4x4 purchases. Very kind you might say? Kind yes, but there is a clever strategy at play here, because when you've truly showcased the capabilities of what a customer's new purchase can do, when driven properly, and in their own hands, those customers turn into quality sales people. And this is positive exposure that cannot be bought. Clever. There was an equal split of Suzuki Jimny's and Grand Vitara's each accompanied by an enthusiastic driver and passenger and after a short theory session with Dr Pepper (ah c'mon that's funny) we set off. As you can see from the attached gallery, Bass Lake 4x4 course is a mixture of small, easygoing obstacles to a 38 degree I-might-need-a-new-pair-of-pants steep mountain! The expert guidance of Alan Pepper was at hand at all times, directing and assisting and being that crucial set of extra eyes you need when tackling a tricky obstacle off-road. Everyone was allowed to take their time and to get it right, and more importantly, get it right safely. It was after all themselves and their own cars they were putting at risk. Alan is an amiable bloke with a genuine love for what he does, and a flair for teaching. You can feel it the second he strikes up a conversation with you. He admits he takes a slightly different approach to off-road driving than what is written about in books and online forums. â€œI don't bother with this "feet off the brakes, only rely on engine compression when we go down a steep incline, stuff that they teach you elsewhere." He remarks, "Your brain is telling you to get on the brakes, so GET ON THE BRAKES!" he adds animatedly. With 30 years of expertise and experience, I and I think all who attended the introductory course were all too happy to take in what he was teaching us, and more importantly successfully apply it to the situation in front of us, which we did every time. The Jimny's? Well, what a car! It punches way above its weight limit and it made the course look ridiculously easy. The Grand Vitara's? Supremely capable and supremely comfortable. The day winds down with a hearty lunch provided by the very pleasant Bass Lake staff on the picturesque balcony and a jovial certificate presentation, after which customers go their separate ways, richer in the knowledge they've obtained during the day, and confident they can now safely take their cars off-road. I hang around a bit longer, picking Alan's brain. We chat about cars and he regales a few war stories. Then a phone call, "Someone's put their car on its side!" he says shaking his head. There's glint in his eye though as he grabs his recovery pack. I have a feeling this will make a good war story and it is after all, all in a day's work for Alan Pepper and his Bass Lake 4x4 crew. 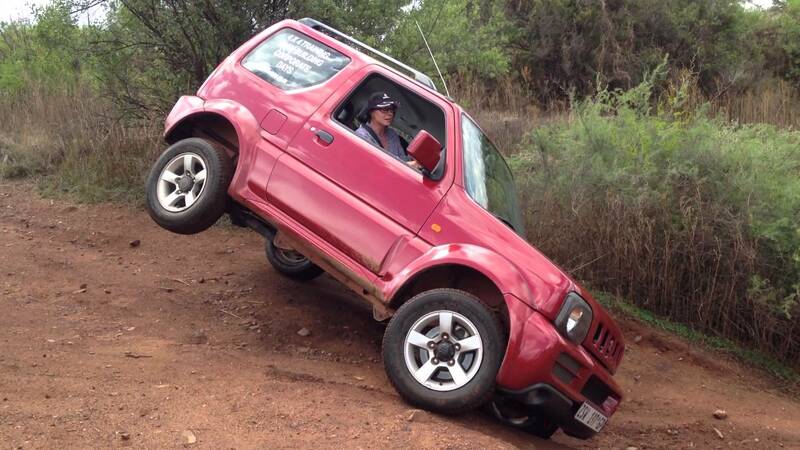 Thank you to Suzuki SA for the use of the Jimny and the complimentary 4x4 course.